Done by Forty: Should We Pay Personal Capital to Advise Us? I should note that we are your typical, passive, index fund investors. We use Bernstein's Simpleton's Portfolio for our retirement accounts, and have a separate asset allocation for our 'Next Home' fund: 50% cash, 30% total bond index fund, and 20% stock index funds. I should also disclose that I am not an investment advisor, and that everything in this post is for informational and entertainment purposes only, and you should definitely not invest as we are, since, let's face it, we're kind of amateurs here. You have been warned. 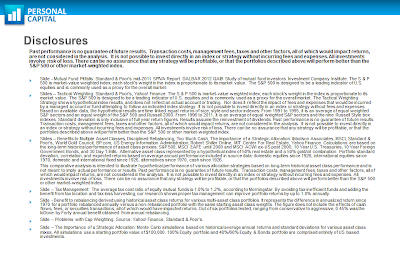 All that said, here is a high level overview of Personal Capital's recommendation. All the images come straight from the presentation Michelle at Personal Capital provided to me earlier in the month, and Michelle has given permission to use the material here on the blog. 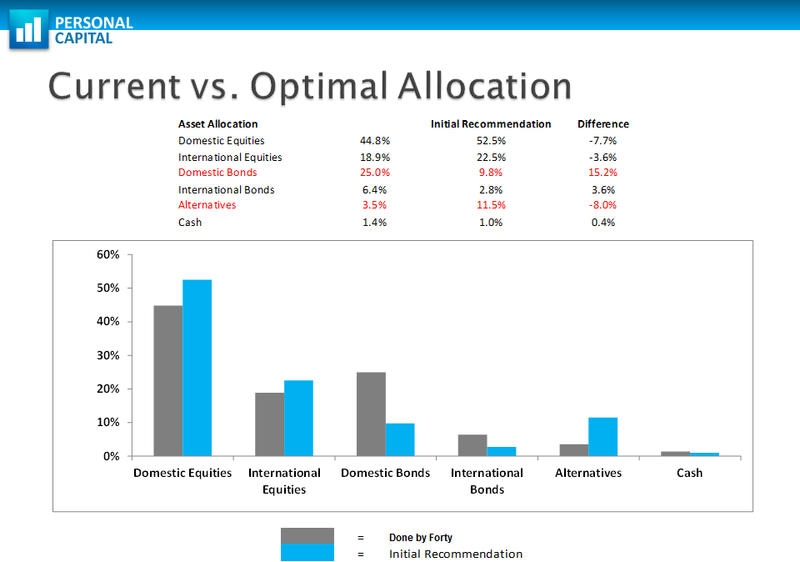 Personal Capital is recommending a significantly different asset allocation than we currently have. Though it should be noted that our two separate allocations (one for retirement, one for our next home) complicate matters. We're carrying more bonds than we will after purchasing our rental property, and have barely any alternatives (like commodities or REITs). Here is where my history with companies who sell financial services causes me clam up. We've personally been sold fish oil before, and have paid the price to the tune of five figure losses and four figure, front-loaded fees. And, just on principle, I immediately get anxious anytime someone claims they are beating the market. It's like hearing someone has a great opportunity in multi-level marketing: it's usually my cue to find my coat and head home. Still, Personal Capital makes a convincing argument with that historical performance. I can see the logic of tactical weighting, for the same reason that diversification and rebalancing is a good idea. Personal Capital also offers tax management services, efficiently placing assets in proper accounts, and using tax loss harvesting to offset gains. Which sounds great, but then there's that scary graphical representation that mutual funds aren't allowed, to be replaced by single stocks. At our level of assets, Personal Capital charges 0.95% of all assets under management per year. The charges are applied at one-twelfth of that amount (0.079%) per month. Included with this fee are the costs for any transactions as assets are purchased or sold throughout the year, are re-balanced, or losses are harvested. Honestly, I am a bit on the fence about the decision. Personal Capital makes a pretty convincing case, and they seem like a great company. I'm not sure whether my hesitation to use their services is driven by logic, or just the natural resistance to change. Personal Capital does not seem like your typical, active management firm -- they seem to be trying to slightly improve on the indexing model. On the other hand, since the fees are based on a percentage of assets under management, the same services become more expensive over time as our net worth grows. What seems like a decent value now might become prohibitively expense in five years. And this represents a pretty significant change to our current strategy of using passively managed index mutual funds as our primary investment vehicle, and doing it all on our own. So I'll turn to you, my excellent readers. Would you consider these sort of services from Personal Capital? Do you already use them for financial advice? DBF I'll manage your money for two beers a year. I manage all my own money, if you get large enough Vanguard will advise you for free. I recommend just use Vanguard index funds, and when your financial nut gets large enough you will then need a tax lawyer for tax efficiency. But what kind of beer? Are you making me shell out for the good stuff? We are currently with Vanguard and will have to check in with them about what kind of funds we need to have before we get those free services. Whoa, we are a long ways off from that. Maybe in a few years! Thanks, Brian. We're pretty similar to Charles, with the exception that we get access to a fee only planner quarterly through my 401K plan at work, so tend to ask him questions if we have them occasionally. As our situation gets more complicated, our tax accountant will help guide us. Personally I thought Personal Capital's process sounded a bit too much like market timing for us. That's a great benefit through your 401k. Does your employer cover the fee, too? Thanks for the feedback, Mrs. Pop. That's two votes against Personal Capitals services so far. They do - the planner comes in once per quarter and if you want a meeting, you just sign up for a time slot. They feel it's part of their fiduciary duty as providers of the 401K. Nothing is ever free l discovered. Personal Capital is basically something like mint l think. The point is to get a hold of all your information, then try and get you to switch to their advisors. I have a cd with Chase and they did the same thing for free. He didn't change anything and l rebalanced it myself last year. 2013 was a good year as l have just taken a look at the dividends that were reinvested. Yes..you can do it yourself. Thanks, Nick. That 3-0 against the services so far: not looking good. We're currently DIY investors, too. I'm with Chase as our brick and mortar checking back (plus some credit cards). What is your impression of the service (or advice) they provided? Sorry Kemkem! I saw "Pretired" and immediately thought of pretired.org. I checked out your blog though and love the photos. Thanks for the feedback on Chase! 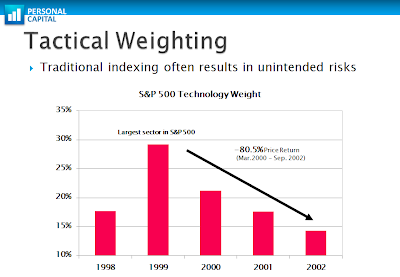 "Tactical" weighting is just the newest marketing term for market timing. It has no founding in any kind of real historical validity. I signed up for Personal Capital a while back and was immediately turned off by the fact that I couldn't segregate my money into different portfolios. Like you, we have different accounts for different purposes and I manage them separately, so right away the tools were pretty useless. That's some great feedback, Matt. 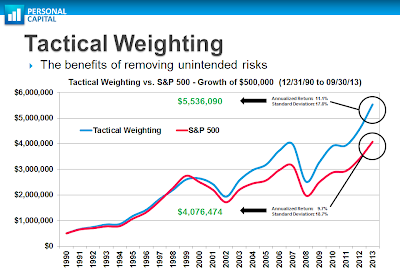 I hadn't thought of tactical weighting as pure market timing, as it seems to be just a different weighting on the broad market. Maybe I'm missing something? I'm certainly no expert. I was thinking I would just unlink my 'next fund' accounts to get a look at my separate portfolios (and maybe set up a separate account with Personal Capital, too, for those "next house" funds). I like the ease of getting my info that way through the software. Ironically, I'll probably still do it manually to keep building out my spreadsheet though, so what's the real benefit? I am sure you could set up more than one account with PC to accommodate multiple portfolios. Active money management almost never pays off over the long term. It would be great if we could move in and out of the market during the best times but short term the market is so irrational no one can consistently do it. 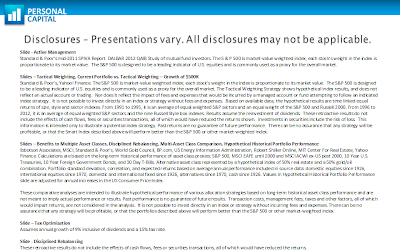 Also, 95 basis points seems a bit high for just investment management. I would check out Portfolio Solutions or Flat Fee Portfolios to compare. Well, it's looking pretty universal: 5-0 against. I haven't heard of those companies before, Michael, but maybe I'll check them out as future post options. I'm of the same belief about active management, too. Indexing has been our path. That just sounds like a web version of active management advising to me. It's really not that hard to set up a Bogleheads-style index funds only approach to your investments. I'm more than happy to help (for free) if you need help with that! That's what I do with my investments personally and it is so easy to maintain. 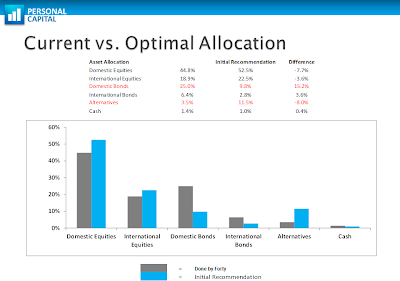 I actually like it not being super easy to check up on my asset allocation so I'm not tempted to re-balance too often. Thanks, Leigh. I may just take you up on that! Rebalancing is something we don't do enough (ok, we have never done it) but 2014 is the year. I'll be reaching out for some help. Great post! I just signed up for Personal Capital and they've been calling me to schedule a "financial consultation." I've been avoiding the calls as I don't have time at the moment and I didn't really want to be sold anything. I like the Personal Capital interface and being able to track my portfolio and expenses is a great tool to have. But I don't know if I want to pay the .95% fee. It doesn't sound like much...but it kinda is. I agree with Charles that you can call up Vanguard who will also advise you for a flat fee...it may be free depending on the amount of assets you have. So you think I should schedule an appointment for the financial consultation with Personal Capital? I'm coming to a similar conclusion, Andrew. 1% is HUGE when applied to your investments over time. Personal Capital would have to outperform my index portfolio by 1% just to break even. As for whether you should take the appointment, I think that really depends on how comfortable you are being pitched. It's a soft cell but it's a slick presentation from a professional company. There's always some risk that we will be sold something that isn't in our best interest. Personally, I'd like to see what they offer you, just for a comparison. I've been advised before, and gone it alone. Ultimately, we decided to fire our adviser three years ago. I felt like we were paying him a few thousand a year to "babysit" our money. The kicker was when I compared the performance of a portfolio I managed and one that he managed and realized, net of fees, that I'd out performed him. This was also at a time when the country was wracked with the financial crisis, and our investments weren't beating the benchmarks. I had a difficult time stomaching the fact that the "experts" at the firm who were supposed to be securing better performance for their fees were being paid bonuses for sub-par performance. Advisers will often say, "Well, my investments are all in these investments too. And, I'm paid on a percentage of your portfolio, so when you don't do well, I don't either...." That's a bit of a falsehood; there's just a smaller upside, but it's still an upside. Your investments could be under-water, but there would still be an upside for an adviser. I agree with those who say you can get decent advice going it alone, with maybe annual advice from a fee-only advisor or someone at a low-cost firm like Vanguard. Vanguard is excellent; I like what they stand for. Because my husband works for a university we consolidated our investments at TIAA-CREF and have been impressed with their service. Full disclosure: our retirement assets have grown to the point where we do qualify for additional services and advising (no extra fee), but we feel that their advice keeps us on track and -- like Vanguard -- their expenses are low. They back their advising decisions with thorough econometric research. Thanks so much for that thoughtful comment, Christy. It's great to get perspective from someone who's performed the DIY and the advisor route. It's looking like the advice is universal: go it alone, or with a fee-only financial planner. FWIW, I currently use Vanguard for everything we can (our 401k is with Fidelity, as that's just the provider our employer chose). I'm also a big fan of their company. I signed up for Personal Capital and within hours started getting high-pressure calls to schedule a "financial consultation." I fired Personal Capital immediately. If they're trying to look like slimy hucksters, that's a great way to do it. The fees for Personal Capital are pretty darn high if you look at them. What fees are you paying on your mutual funds now? (I'd guess sub .5%, depending on your options). Are you going to start paying PC almost double that amount to do almost the same thing? I did their spiel too, but I said no, however, I did turn my mom on to them - she's already retired and needs a bit more help and I did not like her previous advisor (and neither did she really). She's enjoyed working with them. But she's much more of a "hands off, tell me I can keep getting X every month" kind of investor. The PC fees were lower than her previous "advisor"
Good point about the expense ratios of the mutual funds: they're all well under 0.5%. I can see the appeal of Personal Capital if your current fees are much higher, as they still represent a cost reduction. Maybe that explains our reader's reluctance to more to PC's service, too: moving would represent additional costs. PC has a function that evaluates the fees on the mutual funds you are holding. Many are over 1%. 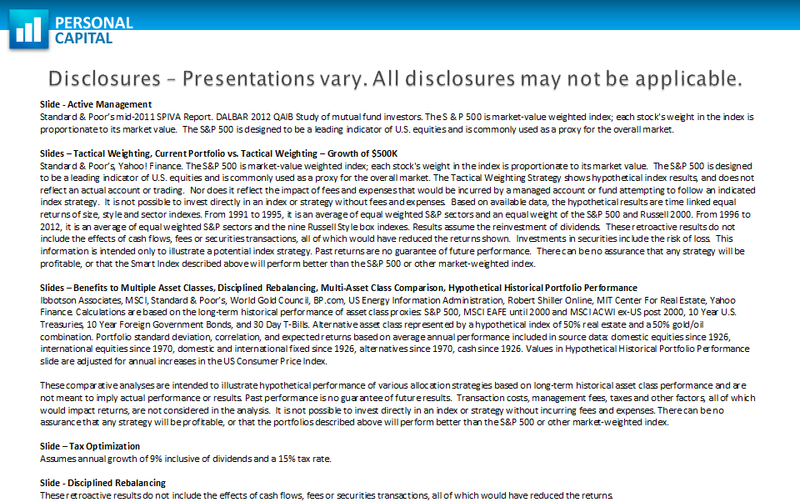 The MF prospectus does not necessarily list them all. Yea nearly 1% on a 500K portfolio is a pretty big drop. Better to learn how to do it as you go along I think. If you make any mistakes when your portfolio is low then hopefully it won't cost you much. If you rely on them while it grows then decide all of a sudden that the percentage charge has become too much, and you haven't been learning how to DIY as your funds have grown, then you are straight in the deep end. I wish we had similar software in the UK, so far my searches have come up with nada! I wonder if their free software would work for you in the UK or not, FIREStarter. May be worth looking into. Interesting point about perhaps becoming reliant on a professional's advice over time. It may be difficult to walk away after so many years. Ultimately that is what they are relying on I think, people set it up and then forget about it and don't ever think if they could be saving $5,000 a year etc. Which like I say is fair enough. I might give it a crack actually to see what happens! I know mint.com doesn't work over here so I won't hold my breath. There is an banking accounts API system over here called yodlee but the frontend user interfaces that have been built for it so far are pretty terrible, and I am not even sure if it will tie in investment accounts, so it's only really for tracking budgets. Having said that, I haven't looked for at least 8 or 9 months, so maybe it's time to look again. So many tech-savvy readers here! I hadn't considered that people outside the US might not be able to use their services, but it's good information to have. "What seems like a decent value now might become prohibitively expense in five years." Because it's a percentage of your money, they'll make more as you make more....so it can't be "prohibitively expensive." However, that doesn't mean it's cheap. I'll ignore tactical weighting (which is baloney, as many have said before me). The big difference that I'm disappointed to not hear from earlier comments is that their asset allocation is WAY better than yours based on your age. Just looking at their chart, they're going to crush you over longer periods of time. Sure, it may only be a 2% better return per year on average, but over 30 years, that's FAR superior. I have no advice about Personal Capital. You're asking a bunch of do-it-yourselfers who get advice for free from people they don't know on the internet. Of course they're going to say "Don't do it." What else would you expect? It seems to me that you're paying a pretty standard fee for professional advice at 1%. I'm more concerned that it's you applying for their services. The little I know of YOU tells me that they aren't for YOU. Personal Capital can do a fine, fine job, I'm sure for people who aren't as savvy. Hey, Joe. Glad to see you're able to comment -- hopefully that glitch fixed itself. "Because it's a percentage of your money, they'll make more as you make more....so it can't be 'prohibitively expensive.'" I don't see it that way. They charge more as I am WORTH more (and in the near future, that's going to be due to my contributions) not necessarily because they've "made me more". Regardless, the number of dollars I pay them per year, for the exact same services, is going to increase dramatically over time. That's the point I'm making. The same advisor doing the same work gets more money per year from me over time. A fee-only or hourly charge model may be more palatable. As for their AA vs. mine, it's complicated by the fact I have two different buckets, and Personal Capital's software lumps them together. Our retirement accounts are in a 25% bonds and 75% stock asset allocation. Their recommended AA is different, but not so different that I'm seeing how it would crush mine. Would love to hear more thoughts on this. Thanks for the encouragement on the affiliate link, Anna! I've got some anxiety over that so I appreciate your comment. 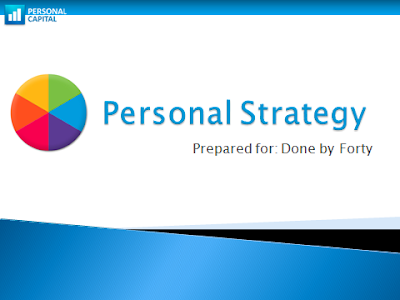 I just signed up for Personal Capital as well and will be scheduling the consultation soon. I was curious to know what they would say. Thanks for going over it here. I already knew that they charged close to 1% for the services. I wouldn't pay for that as I prefer to manage my investments on my own. I'd be surprised if you really get the extra value from paying the fee. Yeah, that's really the question, isn't it, Kay? Whether the extra 1% would yield more than 1% in returns. That has to be the worse the tax efficiency advice I have ever seen. What they just said was, "Plan to lose money, and plan to offset gains with loses." Mutual funds are an excellent ways to manage taxes. You just need the correct funds. I'd pass. Say a good year is 5% and PC just took 1%, or 20% of your gains. I didn't mind the tax advice, as tax loss harvesting is something that can help and I don't do that currently. With a diversified portfolio, it isn't that rare to have an asset class post losses in a given year. My beef isn't with the tax lost harvesting [....] it's with them saying it is the only way to invest tax efficiently. 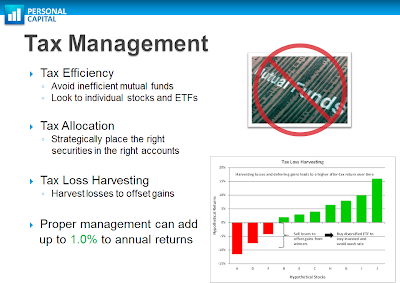 A low fee, low turnover mutual fund or ETF is very tax efficient. They allude to it in the text, but the big red circle with a line over the words "mutual fund" alludes to something else. I assume many people don't want to pay them 1% to invest in a large index fund. Good point: that is a contradiction. I haven't heard from many people that index funds with low turnover are inefficient, tax-wise. It galls me to pay taxes on capital gains of a fund that has lost value. MF can create tax problems of their own. Hmm can you just use their free tools and NOT have them manage your money? Looks like some nice charts included in their software package. 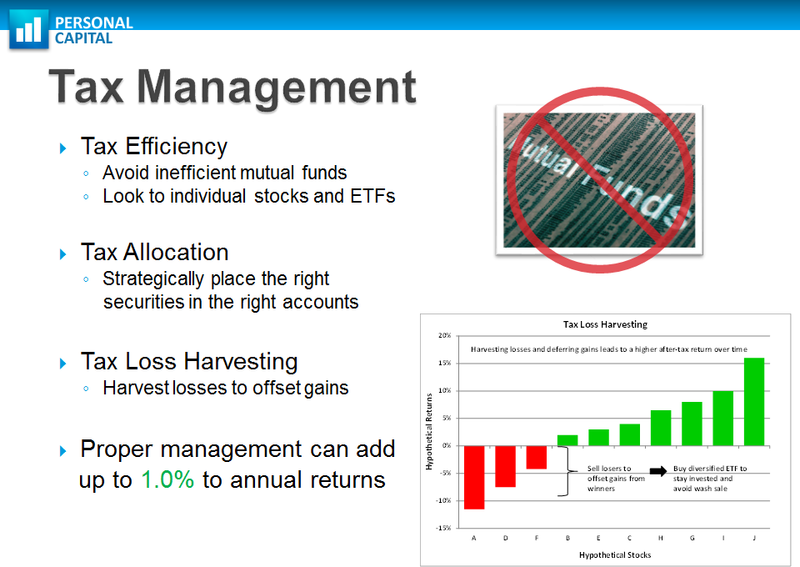 If you are mainly interested in index funds I would just keep managing your money yourself. Hi, DC. I can definitely just keep using their free software. I like it and will probably stick with that regardless. Thanks for the feedback; it seems no one is in favor of going with Personal Capital's services. I am a boring investor who sticks with low cost Vanguard funds so I am probably not the person to ask! I am always skeptical of new companies and products though, so that's probably part of it. I'm with you, Holly, on the boring old Vanguard index funds. Nothing wrong with boring when it comes to our money. You've got to add that 0.95% management fee to the other fees you pay, such as expense ratios, bid/ask spreads when buying stocks, etc. Is it really worth it to pay that much just to have someone tell you to change your asset allocation from what you have been comfortable with? I say no. If you really want to get away from cap-weighted indexing, you can slice and dice a bit and purchase some low-cost mid-cap and small-cap index funds. Pretty simple and it won't cost 0.95% of your assets under management every year. Remember, they would have to beat your current allocation's return by an additional 1% every year to pay for their advice. Not easily done. Thanks, Bryce. With our AA, we have 25% of our retirement funds in a low cost, small cap US index fund. (No specific mid cap though). Probably no easy way to avoid certain sectors representing a larger portion of that portfolio though. Good point about PC starting at a disadvantage: they have to consistently outperform by a percent just to make up for their fee. Wow, the suggestion to buy individual stocks does not sit well with me. I have never heard of tactical weighting before. I think I would need more convincing that they would do 1% better than me on my own, though. I had the same feelings about buying single stocks, though I should note PC is attempting to create their own "index" of sorts by doing so. The rub is picking the right companies: who knows how successful you can be at that. I have considered taking the plunge with them as well. However, I'm unable to pull the trigger after almost a year of sitting on the fence. That management fee is high and scares me a bit. It it was .50%, I may have tossed some money their way. As others have pointed out, picking individual stocks is a scary recommendation. And this is coming from someone who owns individual stocks! That's great feedback, Mr. 1500. I agree that the fee seems fairly high. And if you're not totally comfortable going single stock, then there's very little chance I could be. I doubt I'd sleep well under their plan. I'm on the fence just like you. I like their portfolio recommendations for me and I knew I had too much sitting on the sidelines in cash, but their app and adviser makes it visually stand out. I currently have low cost ETFs so there isn't savings there, but by getting money to work and forcing me to rebalance periodically PC should produce higher returns. I would pick Vanguard Personal Advisor Services over Personal Capital. The fee of 0.3% per year is well below what Personal Capital charges. I turned down PC because I would rather do it myself with index funds. And I get real low rates with the Thrift Savings Plan of the Federal Government (for my 401K) and Fidelity with my other investments. But I don't think PC's 1 percent fee per year is outlandish. Don't most financial advisor companies charge about 1 per cent? I once took a retirement and investment class at an adult school. The teacher was a financial advisor who tried to talk each student into investing with him at 2 per cent!! Of course, he had loads of complicated charts that no one could understand to try to impress us. I tried to get back into this website today to see more comments. I did a search, but I accidentally went into the Retireby40.org website, not this one. this website about Personal Capital were negative. Most people who write reviews of Personal Capital are simply doing it to get revenue. As such, they can't legally review the management services: only the free software they offer. I went the other route, stupidly, which involves no revenue for my little blog. I'm quite late to this thread, but I found your blog by researching this very topic. More specifically, I noticed a preponderance of financial blogs who seem to be recommending Personal Capital. I kind of feel like I'm watching the original "Stepford Wives" movie and all I can think about is "somebody got to them!". So I very much appreciate you didn't take the Personal Capital revenue offer and have provided a forum for honest discourse on the topic without bias. Would you mind sharing what PC are/were offering you? I got the Personal Capital pitch today and they did a pretty good job (and offered me iPads...). Half of my retirement is managed by Charles Schwab and the other half I manage at Schwab. 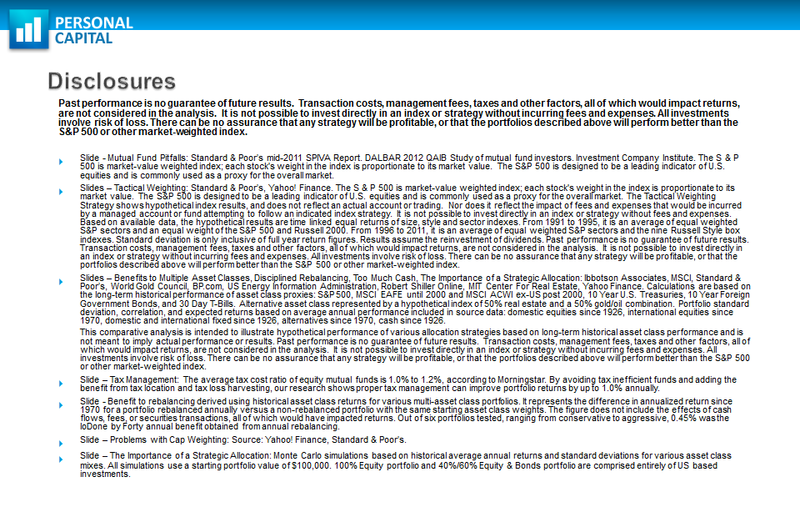 I'm not that impressed by Schwab's management as they have yet to outperform what I manage for myself. I'm a CFO of a company with a master of finance and a law degree but I don't claim any expertise in investment management. That's what made me dissatisfied with Schwab's management, despite being exceptionally happy with all other aspects of Schwab, and so I decided to look elsewhere. Someone above said that Personal Capital's tactical weighting is market timing. That's not correct. It's simply weighting your portfolio equally across sectors to reduce risk. Most managers, and people in general, use sector rotations - i do. It's great if you get it right, but if you look at sector performances over the last 10 years, its a lottery trying to determine which will perform well. I picked correctly the previous 3 years, but in the last year I'm getting smacked around a lot. 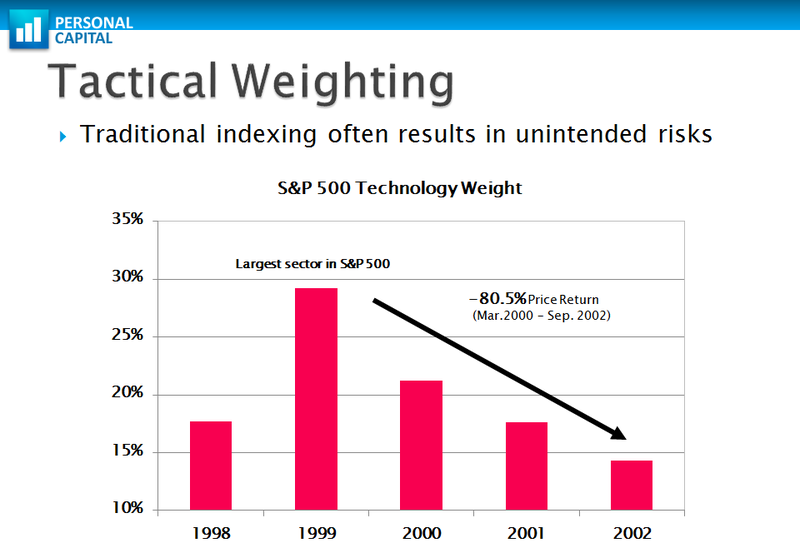 Anyway, PC's approach is to weight sectors equally. The result will be more stable growth. They also pay more attention to small and mid caps than index funds, and counterweight their large cap allocations to reduce the additional risk caused by mega-cap companies distorting the volatility of regular index funds. Anyway, I like their approach quite a lot (at least the theoretical aspect) and the fee seems reasonable as it's more effort than most other companies exert for the same fee. That said, I don't want to have to transfer my accounts as it will effect my banking relationships - lower balances and so I'll have to start paying for wires etc. As a result, I'm going to hold off from PC, but they do rank higher than others I have used/checked out such as Schwab's managed portfolios, intelligent portfolios, market riders, chase's private client management, wells fargo, HSBC Premier. I should note that PC told me they do select individual stocks from time to time, but they do not charge trade fees. Thanks for the excellent comment. I agree that sector weighting isn't exactly "market timing", but it doesn't jive with index investors because it's that same active-investor approach: the market cap that's out there isn't right because of X, and I'm going to pick something else because I think it'll perform better than the market as a whole. The individual stock picking (to represent sectors) was a nail in the coffin for me. I personally don't have faith that someone can accurately predict which companies would represent an index. Hi DBF, in case someone hasn't mentioned it already you might want to check out FutureAdvisor. For free they will analyze your investments and make specific recommendations on how to optimize your investments based on Fama-French models tilting toward small cap and value funds/etfs. FWIW, I went to a fee only advisor (1%+ AUM fee) first for a free consult, got his recommended portfolio for us, and compared it to FutureAdvisor. Nearly identical small cap and value tilt rec's. The only advantage I see to a fee advisor is access to DFA funds which can only be bought through an advisor. 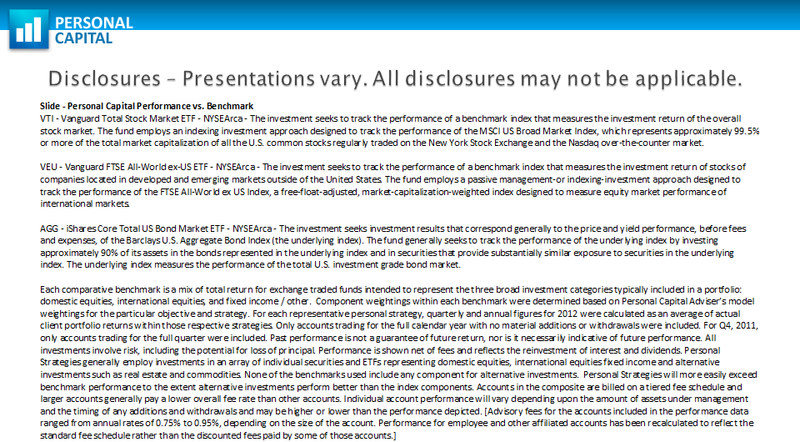 If Personal Capital doesn't offer you theses funds as part of the .95% AUM fee, I say no. 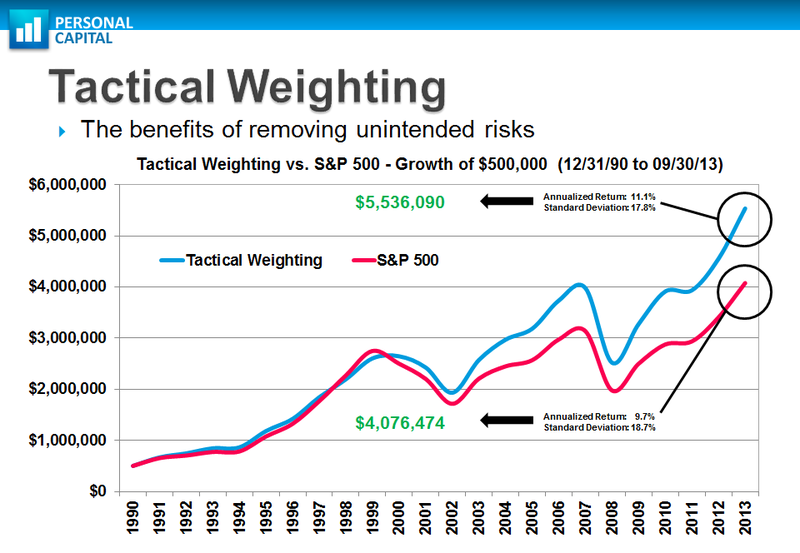 The graph that really got my attention is Tactical Weighing vs S&P 500. If I'm reading it correctly there is a 1.4% annualized return difference. Subtract from that the .95 fee for the advise and you get a real return improvement of .45%. My approach is that I'm never really going to stop watching my portfolio and reading so I' not really turning my portfolio totally over to an advisor. (Otherwise how do I know s/he is performing? Or on the other hand if I do become a passive client I get dumber with time. Not good!) So I see the the .45% as a education fee I'm willing to pay. It just isn't that much. 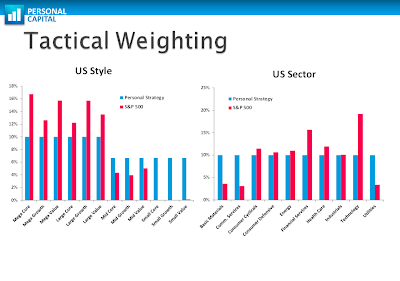 Tactical weighing makes sense but it's really about knowing what are in the funds you choose. It's more complicated than your simpleton approach by a lot, again the return improvement isn't that impressive for the cost of complication. The only real risk reducer is having assets that are truely negatively correlated, that is that if one category goes down the other goes up and sticking to a rebalancing scheme - the classic bonds vs stock scheme. It's tough to buy those falling assets but that's the mathematical truth. I don't see the value in their proposition. You should have done the second call with them (which the rep should have offered, unless you said you were completely disinterested in their service). That's when they analyze your portfolio. Of course they won't tell you what they're going to invest in. Their graph has them beating the S&P 500 virtually every year since 1990. No way! With a selection of 60 stocks and ETFs? No friggin way! No professional portfolio manager for any mutual fund has done that. Not even Vanguard 500 Index fund has matched or beaten the market every year since 1990. And these guys with their fancy software have all the answers? I'd suggest you go with a lot of caution my friends. I had my PC presentation today, and perhaps they have changed up how they demonstrate the results of tactical planning. A lot of the comments from 2014 are incorrect in 2016. They have historical comparisons from 1990/to present that demonstrated the method. It wasn't a pitch. Theynhad hard data. Tactical planning is NOT realigning with what's in out....its about breaking out of the most common form of investing in the US and shifting to under allocated sectors and market caps to buffer fluctuations. I have a friend who turned me onto PC and he is very happy with their service and returns. I'm serious considering going w/ them myself after the portfolio analysis discussion. I like the tactical weighting, tax loss harvesting and automatic rebalancing -- which all takes time which I don't have much of. It is hard to ignore the performance of the highest rated moderate allocation funds like TRP Capital Appreciation, Vanguard Wellington and American Funds Balanced Fund of America when analyzing our own DIY attempts at diversification or Personal Capital's performance. 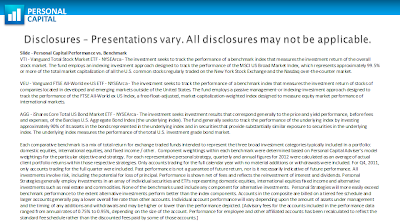 I just checked Vanguard Wellington's performance against all of Personal Capital's portfolios and Vanguard Wellington beat them all 2012-2016 6/30. Albeit by a slim margin. Personal Capital seems to stack up well against great moderate allocation funds. Performance last couple of years below the allocations funds however. FYI I had a call with Personal Capital today and the discussion was all around ETF's (for the stock side - they recommended a much broader diversification including bonds and other assets). Enrolled in PCap. free online tools and now they don't stop calling me...I wonder if they would call me if my net worth was only a couple bucks! No, they definitely would not. As soon as your assets tip $100k, expect a call. That's their model. Set up an interview call for next week after receiving a PC solicitation call. The rep told me that their fee is 0.89% up to $1M and 0.79% if you invest between $1M&3M. We'll see how it goes, but after reading everything on this blog, I'm very hesitant. One of the best suggestions above is to let them work with $25K for a year and compare. I've never allowed anyone to manage my accounts (suspicious and paranoid), since I joined AAII in about 1979. An excellent educational organization with myriad resources. It's a tough call as to whether the advice received even covers the fee for AUM, in my opinion. For me, I'm perfectly fine paying a flat fee for a CFP to create a plan, or charge me hourly for advice. But the idea of the fee being determined by the amount of money I have acquired seems scammy. I feel like fees reduced by increased AUM is pretty common (and has been for the couple of years, I have been aware of the practice). I think PC maybe offering a valid service. We are moving a part of our portfolio over and will look that moving more based upon ongoing performance. We've tried to manage our funds for years and they tend to get out of balance. The tactical weighting seems like a sound emotion free option for keeping things in balance. Their tax loss harvesting sounds like it will potentially cover a good part of our costs too. I just had my free consultation with them last week. I found the equal sector weighting to be very interesting, as I'm a bit concerned with how much of our portfolio is in name-brand mega-cap companies right now (Apple, Google, etc) as opposed to undervalued smaller companies. Although the idea of equal-sector weighting is nice, I can't find any data supporting it. Plus it really changes the nature of your portfolio from tracking the market to trying to beat the market. In short, Tactical Weighting overweights mid-cap by 2% and small-cap by 11%, and overweights value stocks by 1%. This should account for any outperformance. Better absolute performance, but roughly equal risk-adjusted performance. In short, more risk, more reward.